Apple allowed a sneak peek at its flagship store in Beijing on Thursday, along with a glimpse of its China strategy. The two-level store store will open July 19 in Beijing's Sanlitun entertainment district at 10 a.m., Apple's first in China and its 219th worldwide. "This is the first of many stores we will open in China," said Ron Johnson, Apple's senior vice president of retail, in remarks at the store. He later added that Apple will open stores "in Beijing, in Shanghai and beyond," and confirmed that another store will open in Beijing's Qianmen area, a shopping street south of Tiananmen Square that has been renovated ahead of the Olympic Games, which begin next month. Qianmen was thought to be the location for Beijing's Apple Store when it was first reported. The store will offer Genius Bar services in Chinese and English, said John Ford, the store's manager, with support in some other languages available, including German. Absent from the store's opening will be sales of the iPhone, either in its early 2G (second-generation telephony) version or the new 3G (third-generation telephony) model. Although negotiations between Apple and China Mobile—the world's and China's largest mobile service provider—have taken place over the last 12 months, no deal has been announced. Apple representatives confirmed that the iPhone will be available in China but gave no date, and declined to comment on any talks with Chinese mobile operators. The 3G iPhone, launched July 11 in the U.S. and some Asian markets such as Japan and Hong Kong, faces a particular challenge in China. The country does not have commercial 3G service yet, and when it does, it is expected to use exclusively TD-SCDMA (Time Division Synchronous Code Division Multiple Access), a domestic standard current incompatible with other 3G formats. An estimated 400,000 to 1 million of the original iPhones are in use in China, according to research firm In-Stat, despite never being officially launched here. What Chinese users will be able to get is Apple's complete line of computers and iPods, including the iPod Touch. The Touch will be available with up to 32GB of memory, retailing for 4,488 Chinese yuan (US$647.33). The same item sells for $499 on Apple's U.S. online store. 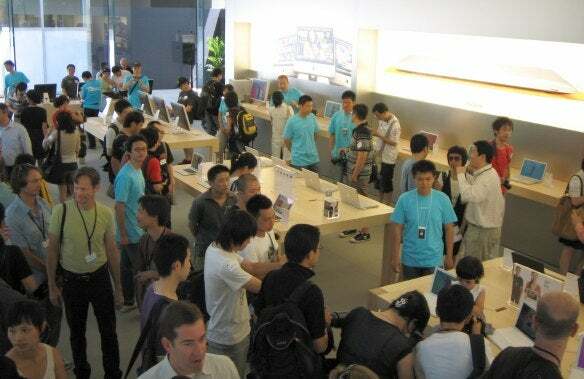 Apple has opened its first store in China, in Beijing. Located in Beijing's Sanlitun entertainment district, about 3.5 miles (5.6 kilometers) northeast of Tiananmen Square, the Apple Store is overshadowed by another flagship retail outlet that has given the Village in Sanlitun complex its informal name: the "Adidas mall." Whereas the sporting goods giant's emporium faces Workers Stadium North Road, one of Beijing's busiest streets, the Apple Store dominates the inner courtyard, with the storefront and a facing video screen playing the "dancing iPod" video. Apple's presence in China has grown considerably since the introduction of the iPod five years ago. Before then, the company was almost invisible here, except for expatriates who brought their own from home, and designers, artists and Apple fetishists who brought them from the few specialty stores that sold their products. One major factor was applications, and specifically the lack of pirated Apple software. Computer users running Windows could easily access pirated—and therefore inexpensive—software, which could be loaded into cheap homemade PCs. Apple products were more expensive, both the software, which required the purchase of genuine editions that often had to be imported from overseas, and the hardware.